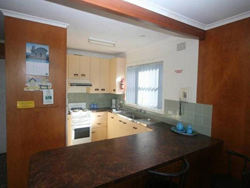 * Beachfront location on Lighthouse Beach. * Double-storey brick home that is fresh, clean, comfortable and family friendly. * Double lock-up garage (room for small boat). * 2 bathrooms (1 upstairs, 1 downstairs). * Fully appointed kitchen, including microwave, fridge, toaster, sandwich maker etc. * Beds have innerspring mattresses, doona's and blankets supplied (guests supply their own linen and towels, please). * Full length sunroom with Italian leather armchair lounges. * Modern d�cor and quality timber furniture. * Comfortable lounge and dining room. * Good quality crockery, cutlery and glasses to accommodate 8 persons. * TV, VCR, Sony Playstation, & Hi-Fi (complete with wide section of CD's and video tapes). * Laundry facilities, incl. washing machine. * Smoke detectors, electrical safety switches and fire extinguishers fitted. * Fully fenced safe yard.